ADHEAR bone conduction system is a revolutionary, non-surgical hearing solution that is a perfect choice for adults and children of all ages. ADHEAR can be an excellent option for anyone who is affected by conductive hearing loss, awaiting bone conduction surgery, has a blocked ear canal, glue ear, or a middle ear which doesn’t function correctly after infections or surgeries. The ADHEAR is light and discreet as it’s worn inconspicuously behind your ear making it an excellent choice for children. 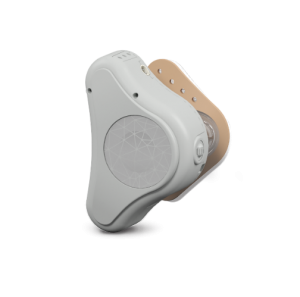 ADHEAR works with the principle of bone conduction to help you hear. This means that the hearing system converts sound into vibrations and transfers them to the bone. The bone can conduct vibrations to the inner ear where they are perceived as sound. 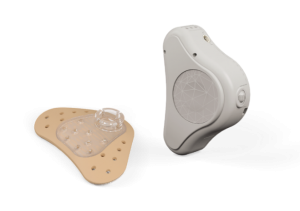 The novel system has just two external parts: an adhesive pad which sticks gently behind the ear and an audio processor which clicks onto this; together they don’t apply any pressure onto the skin. This unique system sees the adhesive staying securely in place which allows you or your child to enjoy a continual hearing experience without interruption caused by movement, which can sometimes occur with bone conduction headbands. In addition, the close proximity to the inner ear ensures sound information can be transferred efficiently. ADHEAR delivers clear hearing benefit. Tests have shown that the performance of this new bone conduction system is comparable or even better than that of other similar bone conduction devices. ADHEAR is extremely comfortable to wear, delivers immediate results and it also looks great. It is simple to use and so easy to put on in the morning it becomes part of your daily routine. With its gentle adhesive pad it’s as easy as: Stick. Click. Hear. To see what a difference ADHEAR has made to one of young users, 11-year-old William, click the image below and scroll down to the video. The BONEBRIDGE is the first active bone conduction implant system that leaves the skin intact; with no abutments the implant is placed completely underneath the skin for a discrete option and no daily wound care. This ensures an extremely low risk of skin complications or infection. This visually-appealing system consists of the SAMBA, an externally worn audio processor, and a surgically-inserted bone conduction implant (BCI 601) that lies directly beneath the skin. The compact audio processor can be worn discreetly beneath the hair, or with a range of vibrant design covers you may choose to stand out in the crowd. We understand that each individual child has unique needs when it comes to choosing the right hearing system for them. 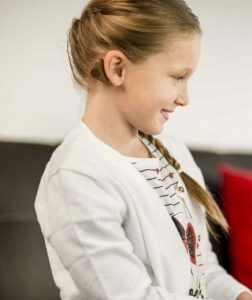 The BONEBRIDGE hearing implant solution can be an effective solution if your child has a conductive hearing loss, mixed hearing loss or single-sided deafness or following middle ear operations and malformations. The BONEBRIDGE is suitable for everyone five years and above. 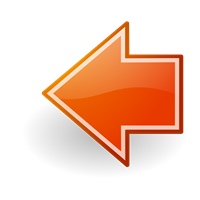 With conductive or mixed hearing loss, sound cannot take the natural path through the outer and middle ear to the inner ear. With the BONEBRIDGE, the sound waves are transmitted via bone conduction directly to the inner ear, where they are processed as natural sound.